Bolton is the birthplace of Amir Khan, a boxing world champion and Olympian, who first inspired his hometown public when he bombarded his way to glory with a silver medal at Athens 2004. However, if you don’t want to be boxed into a corner by unscrupulous local car buyers then you have to dance your way down to WeWantAnyCar.com. We are located on Car Park A of Macron Stadium. If travelling from the North down the M6 follow signs for the M61 and leave at Junction 30. Once on the M61, follow signs for Manchester/Bolton and leave at Junction 6 (Macron Stadium should be visible on the left). Take the first exit off the roundabout onto the A6027, the De Havilland Way. At the next roundabout, take a left turn onto Burnden Way and park in the main stadium visitors' car park. 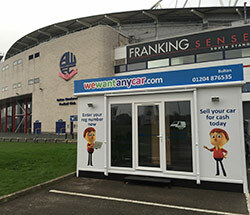 So get started on selling your car in Bolton today by calling Paul on 01204 876 535 or by emailing us at bolton@wewantanycar.com. Process exactly as described on the website. On line quote very helpful in grading the quality of the car. Price agreed was even slightly higher than the quote. First time we have used this method to sell a car. Paul at our local branch was excellent. The process was quick,thorough and fair. Would absolutely recommend and will use we want any car again in the future. Easy to use website. Option of several locations for appointment.Good follow up by advisor when arranging an appointment. Valuation manager at appointment was professional and offered acceptable explanations for revision of the original on-line valuation. Final valuation was in line with what I expected to receive. Money was in my account 3 days later on the date stated. Convenient, easy and quick service. Friendly, fair and helpful staff. I decided to sell my car on Thursday. I booked an appointment with the Bolton branch for Saturday 10:45. A little over an hour later, the car was sold, luckily I brought my set of spare keys, log book etc. (as mentioned on their website). As for price, I couldn't be happier, yes they reduced the price from the original online quote, but everything was explained. I was pleasantly surprised with how simple the whole process was, and I would use them again.